Royal Apartments and the Hall of Mirrors. 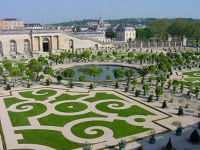 The Grand Trianon (1687) and the Petit Trianon (1762) are also in the park. The former, built in stone and marble, housed Louis XIV's mistress, while the latter, a small manor house, was home to Louis XV's mistress. The Château de Versailles, the royal palace of Versailles, near Paris. This is one of the main attractions in France and is a World Heritage site(Classified World Heritage by on UNESCO since 1979). The Chateau de Versailles castle is also one of the largest palaces in the world. The palace was built in the 17th century. It is today one of the most visited French tourist attractions with more than 2,5 million tourists visiting the castle every year. Since 1995, Versailles has been administered by a public institute (Etablissement Public du Musée et du Domaine National de Versailles) with around 800 people enployed.